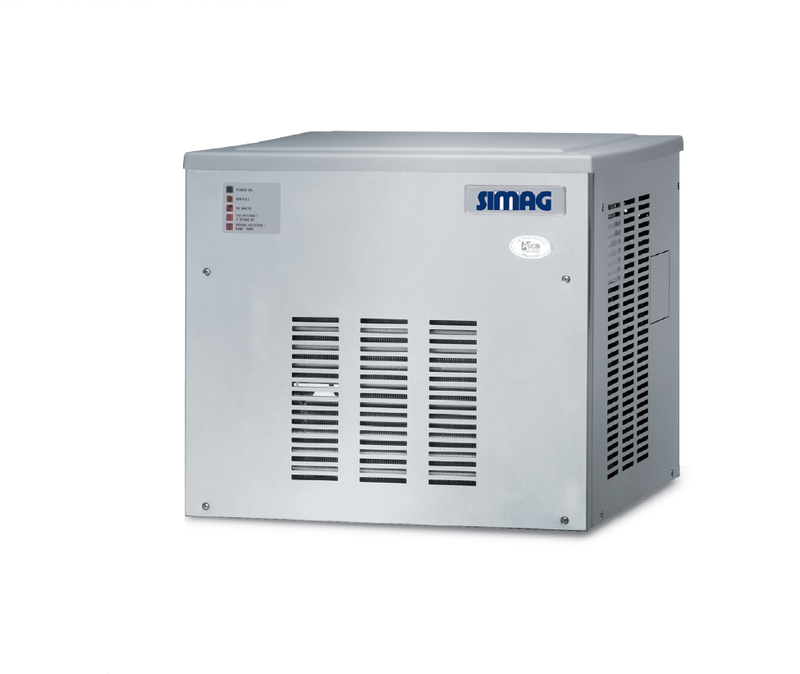 Simag Flake Ice Machine SPR 80Commercial and Industrial Flake Ice Machines suitable for all kind of establishments including bars, restaurants, coffee shops, pastry shops, pubs and more. 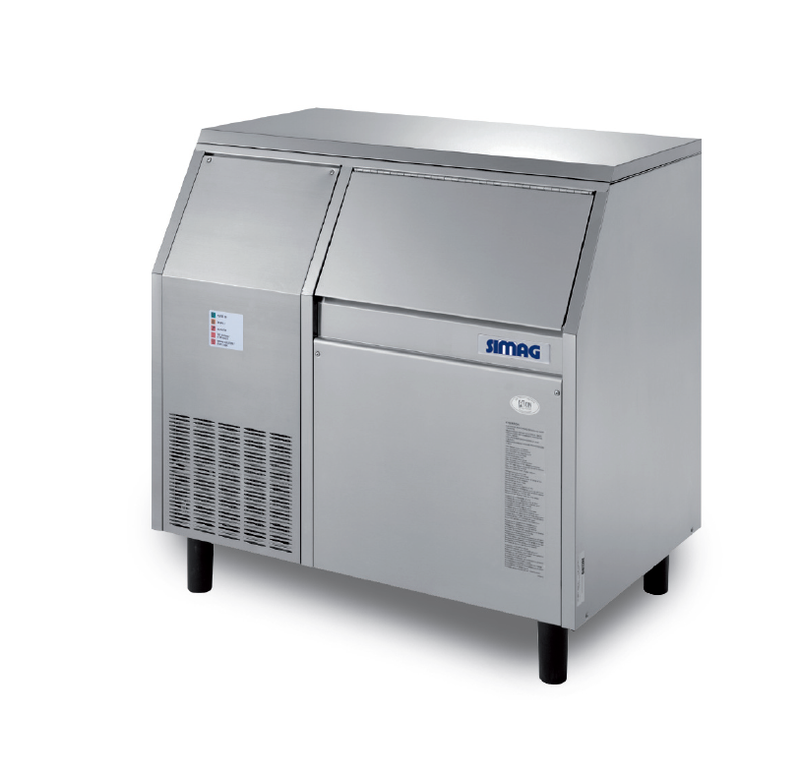 The crushed ice is perfect for cocktails and other frozen drinks, or for fish and food industries for display and storage The Simag range of ice machines are designed and manufactured in Italy with continued innovation and excellent quality control. Simple and reliable, SIMAG products represent the best ratio of quality to convenience on the market. The SIMAG SPN range has a model for every need including restaurant, bars, hotels. A simple water and electrical connection is all you need to have a high-quality ice production.Features:• Electronic control• Stainless steel bodywork - scotch brite• Air or water cooled (on demand)• Direct transmission• Easily accessible components• Low power and water consumption• Reduced dimensions• Continuous production• Refrigerant R134a 24 Hour Ice Production - 10°C/10° CAir Cooled 70 kg Water Cooled 73 (on demand)Bin Capacity 25 KgVoltage230/50/1 standard version 220-240/60/1 on demand Warranty 3 years warranty on components..
Simag Flake Ice Machine SPN 125 Commercial and Industrial Flake Ice Machines suitable for all kind of establishments including bars, restaurants, coffee shops, pastry shops, pubs and more. The crushed ice is perfect for cocktails and other frozen drinks, or for fish and food industries for display and storageThe Simag range of ice machines are designed and manufactured in Italy with continued innovation and excellent quality control. Simple and reliable, SIMAG products represent the best ratio of quality to convenience on the market. The SIMAG SPN range has a model for every need including, hotels, food industry. It is perfect for fishmongers other food processing companies. A simple water and electrical connection is all you need to have a high-quality ice production.Features:• Electronic control• Stainless steel bodywork - scotch brite• Air or water cooled (on demand)• Direct transmission• Easily accessible components• Low power and water consumption• Reduced dimensions• Continuous production• Refrigerant R134a 24 Hour Ice Production - 10°C/10° CAir Cooled 120 kg Water Cooled 120 (on demand) Voltage230/50/1 standard version 220-240/60/1 on demand Warranty 3 years warranty on components..
Simag Flake Ice Machine SPN 255 Commercial and Industrial Flake Ice Machines suitable for all kind of establishments including bars, restaurants, coffee shops, pastry shops, pubs and more. The crushed ice is perfect for cocktails and other frozen drinks, or for fish and food industries for display and storageThe Simag range of ice machines are designed and manufactured in Italy with continued innovation and excellent quality control. Simple and reliable, SIMAG products represent the best ratio of quality to convenience on the market. The SIMAG SPN range has a model for every need including, hotels, food industry. It is perfect for fishmongers other food processing companies. A simple water and electrical connection is all you need to have a high-quality ice production. Features:• Electronic control• Stainless steel bodywork - scotch brite• Air or water cooled (on demand)• Direct transmission• Easily accessible components• Low power and water consumption• Reduced dimensions• Continuous production• Refrigerant R134a 24 Hour Ice Production - 10°C/10° CAir Cooled 200 kg Water Cooled 205 (on demand) Voltage230/50/1 standard version 220-240/60/1 on demand Warranty 3 years warranty on components..
Simag Flake Ice Machine SPR 120 Commercial and Industrial Flake Ice Machines suitable for all kind of establishments including bars, restaurants, coffee shops, pastry shops, pubs and more. The crushed ice is perfect for cocktails and other frozen drinks, or for fish and food industries for display and storageThe Simag range of ice machines are designed and manufactured in Italy with continued innovation and excellent quality control. Simple and reliable, SIMAG products represent the best ratio of quality to convenience on the market. The SIMAG SPN range has a model for every need including restaurant, bars, hotels. A simple water and electrical connection is all you need to have a high-quality ice production.Features:• Electronic control• Stainless steel bodywork - scotch brite• Air or water cooled (on demand)• Direct transmission• Easily accessible components• Low power and water consumption• Reduced dimensions• Continuous production• Refrigerant R134a 24 Hour Ice Production - 10°C/10° CAir Cooled 120 kg Water Cooled 120 (on demand)Bin Capacity 55 KgVoltage230/50/1 standard version 220-240/60/1 on demand Warranty 3 years warranty on components..
Simag Flake Ice Machine SPR 200 Commercial and Industrial Flake Ice Machines suitable for all kind of establishments including bars, restaurants, coffee shops, pastry shops, pubs and more. The crushed ice is perfect for cocktails and other frozen drinks, or for fish and food industries for display and storageThe Simag range of ice machines are designed and manufactured in Italy with continued innovation and excellent quality control. Simple and reliable, SIMAG products represent the best ratio of quality to convenience on the market. The SIMAG SPN range has a model for every need including restaurant, bars, hotels. A simple water and electrical connection is all you need to have a high-quality ice production.Features:• Electronic control• Stainless steel bodywork - scotch brite• Air or water cooled (on demand)• Direct transmission• Easily accessible components• Low power and water consumption• Reduced dimensions• Continuous production• Refrigerant R134a 24 Hour Ice Production - 10°C/10° CAir Cooled 200 kg Water Cooled 200 (on demand)Bin Capacity 55 KgVoltage230/50/1 standard version 220-240/60/1 on demand Warranty 3 years warranty on components..
Simag Flake Ice Machine SPN 405 Commercial and Industrial Flake Ice Machines suitable for all kind of establishments including bars, restaurants, coffee shops, pastry shops, pubs and more. The crushed ice is perfect for cocktails and other frozen drinks, or for fish and food industries for display and storageThe Simag range of ice machines are designed and manufactured in Italy with continued innovation and excellent quality control. Simple and reliable, SIMAG products represent the best ratio of quality to convenience on the market. The SIMAG SPN range has a model for every need including, hotels, food industry. It is perfect for fishmongers other food processing companies. A simple water and electrical connection is all you need to have a high-quality ice production. 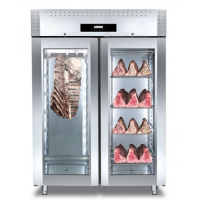 Features:• Electronic control• Stainless steel bodywork - scotch brite• Air or water cooled (on demand)• Direct transmission• Easily accessible components• Low power and water consumption• Reduced dimensions• Continuous production• Refrigerant R134a 24 Hour Ice Production - 10°C/10° CAir Cooled 320 kg Water Cooled 330 (on demand) Voltage230/50/1 standard version 220-240/60/1 on demand Warranty 3 years warranty on components..
Simag Flake Ice Machine SPN 605 Commercial and Industrial Flake Ice Machines suitable for all kind of establishments including bars, restaurants, coffee shops, pastry shops, pubs and more. The crushed ice is perfect for cocktails and other frozen drinks, or for fish and food industries for display and storageThe Simag range of ice machines are designed and manufactured in Italy with continued innovation and excellent quality control. Simple and reliable, SIMAG products represent the best ratio of quality to convenience on the market. The SIMAG SPN range has a model for every need including, hotels, food industry. It is perfect for fishmongers other food processing companies. A simple water and electrical connection is all you need to have a high-quality ice production. Features:• Electronic control• Stainless steel bodywork - scotch brite• Air or water cooled (on demand)• Direct transmission• Easily accessible components• Low power and water consumption• Reduced dimensions• Continuous production• Refrigerant R134a 24 Hour Ice Production - 10°C/10° CAir Cooled 600 kg Water Cooled 600 (on demand) Voltage230/50/1 standard version 220-240/60/1 on demand Warranty 3 years warranty on components..
Simag Flake Ice Machine SPN 1205Commercial and Industrial Flake Ice Machines suitable for all kind of establishments including bars, restaurants, coffee shops, pastry shops, pubs and more. The crushed ice is perfect for cocktails and other frozen drinks, or for fish and food industries for display and storageThe Simag range of ice machines are designed and manufactured in Italy with continued innovation and excellent quality control. 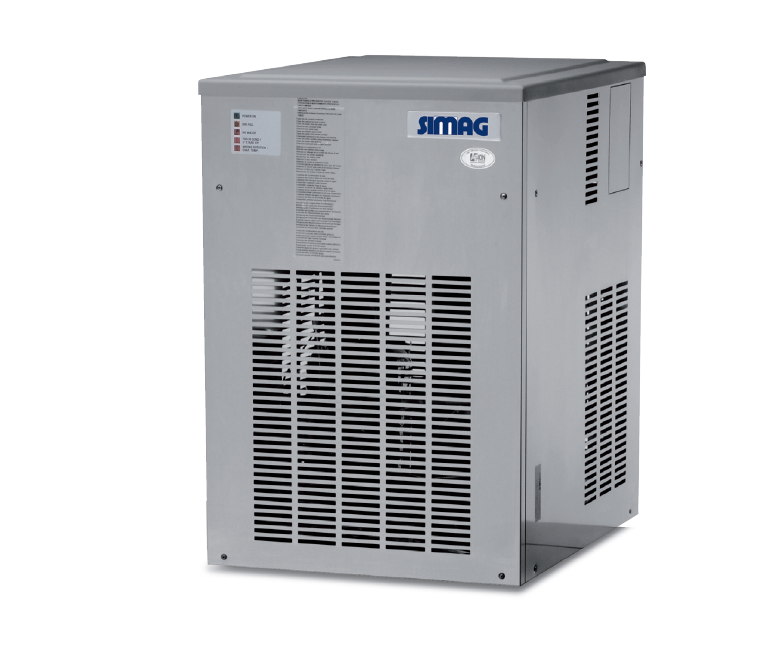 Simple and reliable, SIMAG products represent the best ratio of quality to convenience on the market. The SIMAG SPN range has a model for every need including, hotels, food industry. It is perfect for fishmongers other food processing companies. A simple water and electrical connection is all you need to have a high-quality ice production. Features:• Electronic control• Stainless steel bodywork - scotch brite• Air or water cooled (on demand)• Direct transmission• Easily accessible components• Low power and water consumption• Reduced dimensions• Continuous production• Refrigerant R134a 24 Hour Ice Production - 10°C/10° CAir Cooled 1150 kg Water Cooled 1200 (on demand) Voltage400/50/3N standard version 400/50/3N on demand Warranty 3 years warranty on components..